Fence Repairs/Installation: Fences require continual maintenance and upkeep. We can always use a hand re-sinking a T-post or re-hanging wire or simply walking the fence line to monitor conditions. There also seems to be an ongoing need for additional paddock/pen areas, and we need help installing small fence lines. Storage/Hay Barn Renovation: We have a great hay barn, but years of wind and rain have damaged the wood. The barn needs renovation to replace rotten wood that now leaks during the rainy weather. The current condition will not keep hay dry during the winter. 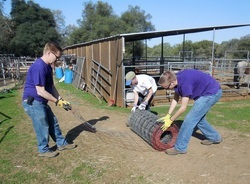 If you have unused wood or construction experience, the storage/hay barn needs your help! Wood cutting/splitting: Over the years, numerous trees have fallen in the pasture areas. The longer the trees are down and uncut, the greater the chance for wood rot. The wood can be cut and split for firewood, and sold as a fundraiser for the rescue. We’d be happy to share the wood. Tree trimming/Mistletoe removal: There are many oak and pine trees in the pastures and paddock areas. Many haven’t been trimmed for years, and several of the oaks are infested with mistletoe. These trees provide lots of good cover and shade for the horses in the pasture/paddock areas, and we can’t afford to lose any. If you can trim/remove mistletoe from even one tree, that’s one less we’ll need to worry about, and one more the horses can relax under. Poison Oak Removal: Several of us are terribly allergic to poison oak, and there is poison oak at various areas on the property. If you are not sensitive to it and can search for it and remove it or spray it, we will have less worry about the horses getting into it, then exposing handlers. Blackberry Removal: A beautiful seasonal creek runs through the main pasture. However, over the years, the blackberries have overtaken the creek. Dense blackberry bushes cover the creek from end to end on the property. Not only does it cover and hide the creek, it creates a barricade that prevents the horses from crossing the creek to the grassy area on the other side. We need help clearing areas to allow the horses to cross the creek and get to the grass on the other side. Click here if you are interested in helping.